I recorded a victory last night. Much to my surprise, Adrienne expressed an interest in watching Planet Of The Apes (1968). Even more stunning - she liked it. A lot. I realize this probably doesn't seem like that big of a deal, but Adrienne has long expressed to me an aversion to sci-fi movies. I've never protested much because she's always been very tolerant of my appetite for horror. She doesn't always see the value of every horror movie that I like, but we've watched enough horror together over the years that I've gotten a pretty good feel for which ones she's likely to enjoy. The corollary of that is that I've also developed a sense of which horror movies I should just go ahead and watch on my own. If I don't subject her to too many horror movies that I know she isn't going to like, she continues to be willing to watch the ones I think she might like. It's a delicate balance. Because I'm already fighting the battle on that front, I've never pushed very hard with the sci-fi movies. She gave me an in, though. She enjoyed the recent reboot of the franchise, Rise Of The Planet Of The Apes (2011), and apparently that piqued her interest in seeing the original. 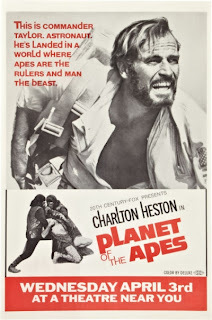 Charlton Heston starring in the original probably only sweetened the pot. Heston is kind of like a gateway drug for people who don't like sci-fi. He clearly isn't a man who's going to tolerate any foolishness, so his participation is a seal of approval for the non-fanboys. Moses wouldn't let his people wander aimlessly for forty years in the realm of science fiction, right? Heston always gets everyone on board by playing to the cheap seats. Could anyone have growled "Get your filthy paws off me, you damn dirty ape!" with more badass conviction? In particular, though, Adrienne was pleased by the fact that her mind was engaged while watching Planet Of The Apes. I believe it was eye opening for her to realize that sci-fi isn't all just ray guns, robots, and light shows. She's anxious to watch the rest of the franchise now, and I'm excited to be watching them again with someone who's excited to be seeing them for the first time. The best part of this episode for me was the fact that Adrienne had no prior knowledge of the twist ending that closes Planet Of The Apes. I was surprised because I suppose I thought it was one of those pop culture things that everyone knows by osmosis, even if they've never seen the movie. *SPOILER* I can't even express what a pleasure it was to watch Adrienne see the buried Statue Of Liberty come into view and suddenly have everything she'd just watched fall into place. I envied her. 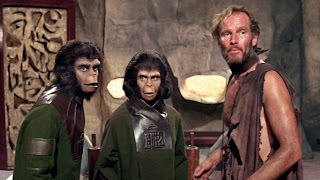 I guess in a few years I can once again experience that moment vicariously when I get to share Planet Of The Apes with Gunnar for the first time. Is it weird that I'm most looking forward to watching "the ape out of water" entry Escape From The Planet Of The Apes (1971) again? 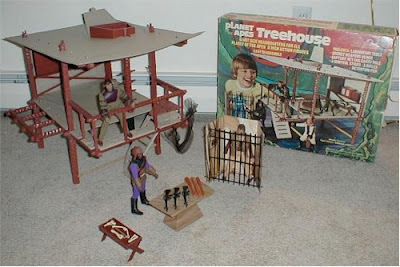 I had this when I was a kid. You're jealous, aren't you? i had the treehouse too, sadly only one monkey figure... it was weird having the hulk show up for capture. 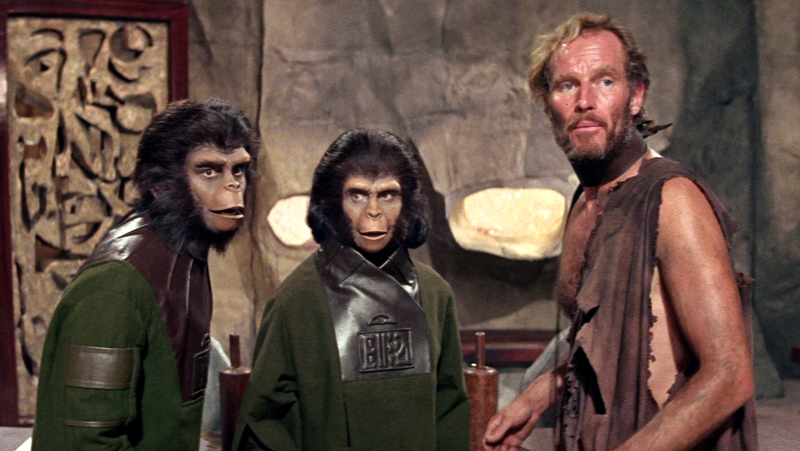 planet of the apes, was my first real introduction to science fiction, where we sort of destroy ourselves. the newest film at some point made a good couple of references to get us there.